Carly loves her older brother, Alex, but sometimes she wishes he were more like her friend Annie's brother. 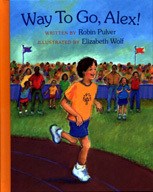 One day Carly's mother tells her that Alex is going to compete in Special Olympics. Carly works hard to help Alex get ready for his events. In the end, Carly gains new understanding and appreciation of her brother. Way To Go, Alex! has its seeds in my own family life. Events that present a challenge and also have strong emotional content often strike me as good story ideas. 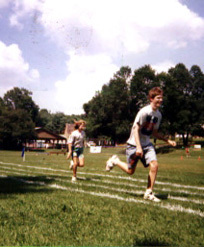 Special Olympics Track and Field events have definitely challenged my son, David, who has multiple handicaps. Indeed, helping him prepare has challenged the whole family. Special Olympics is a deeply emotional experience. Volunteers, coaches, and families all pull together and cheer the athletes on. Enthusiasm, optimism, joy, and the suspense of competition combine with the rewards of accomplishment and community. When my daughter, Nina, was young, she often longed for a "normal" brother. Special Olympics helped her find the pride she wanted to feel. In Way To Go, Alex! I switched the ages of my own children, so that the narrator, Carly, would be of picture-storybook age, and her brother, Alex, would be older, of competition age. The illustrator, Elizabeth Wolf, lives far away from me, in Idaho. I mailed her photographs of David at Special Olympics. I suspect the one at left provided the model for the cover illustration.